While researching the history of chimneys, I came across this medieval image on two different sites, neither of which gives any details. Source: Dark Ages Project. The same picture can also be found here. Can anyone put an approximate date on this picture? 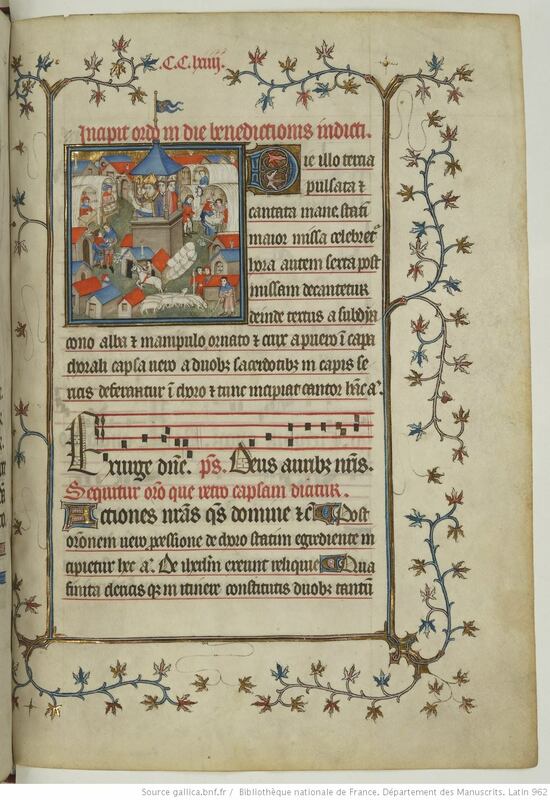 I'd also like to know where it is from (knowing the actual manuscript - if that is the source - would be great, but I'll settle for a region or country). I'm also curious about the large (and not-at-all-to-scale) structure in the middle of the picture. Are these priests preaching or perhaps blessing (if so, no one seems to be paying much attention), or is this scene purely artistic licence? My reason for wanting to know the date & source of this picture relates to chimneys: it appears that they became widespread later in Britain (16th century) than in Italy (14th century or earlier), but the evidence is not conclusive. Please note that chimneys are not part of the question, just the reason for it. The image shows shows the Fair at Lendit in France. It is taken from a 15th century manuscript held at the Bibliotheque Nationale in Paris France. MS Latin 962 folio 264. The suggested date for the manuscript is 1405-1410, which should help narrow down your research. The whole manuscript has been scanned, and is available online. Bibliothèque nationale de France. Département des Manuscrits, Troyes. Pièces notées (notation carrée sur 4 lignes rouges). Rajouts des XVe et XVIe siècles en écriture cursive, dans les marges et en fin de volume. Enluminé par le Maître des Heures de Troyes. 21 miniatures, Initiales peintes à antennes ou historiées sur fond d'or. Parchemin, I-VII + 276 ff. (foliotés 1 à 275, présence d'un f. 233bis), 310 x 220 mm (just. 195 x 125 mm). 4 cahiers de 8 ff. (241-272), 1 cahier de 3 ff. (273-275 ; un f. monté), précédés et suivis de 4 ff. de gardes de papier (1830-1848). Restes de papiers anciens (serpentes ?) dans certains fonds de cahiers. d'origine, en chiffres romains, à l'encre rouge. Réglure légère à l'encre brune. Demi-reliure de chagrin rouge, plats de veau raciné, tranches dorées, au chiffre de Louis Philippe (1830-1848), titrée "PONTIFICALE" au dos, signée Lefèvre. Reliure restaurée en 1961 dans les ateliers de la BN (reprise du dos, rattachement de plat). Estampille de la Bibliothèque royale au XVIIe siècle. National Library of France. Department of Manuscripts, Troyes. Noted pieces (square notation on 4 red lines). Additions XV th and XVI th centuries in cursive, in the margins and end of the volume. Enlightened by the Master of the Hours of Troyes . 21 miniatures, initials painted with antennas or historiated [!] on a gold background. Parchment, I-VII + 276 ff. (foliated 1 to 275, presence of a 233bis), 310 x 220 mm (just 195 x 125 mm). 36 notebooks: 1 notebook of 7 ff. (I-VII, one of the ff was cut), 29 notebooks of 8 ff. (1-232), 1 notebook of 9 ff. (233-240, one mounted), 4 notebooks of 8 ff. (241-272), 1 notebook of 3 ff. (273-275, one mounted), preceded and followed by 4 ff. paper guards (1830-1848). Remains of ancient papers (snakes?) In some notebooks. of origin, in Roman numerals, in red ink. Light rule in brown ink. Half-binding of red sorrow, veal dishes, golden slices, with the figure of Louis Philippe (1830-1848), titled "PONTIFICALE" on the back, signed Lefèvre. Binding restored in 1961 in the workshops of the BN (recovery of the back, attachment of plate). Stamp of the Royal Library in the XVII th century. which is where the Foire du Lendit took place. And can be dated with additional detail to found here. La Bénédiction du Lendit. Miniature du manuscrit latin Pontificale Senonense, édité entre 1301 et 1400. – Pontifical de Sens, XIVème siècle, latin 262, F. 264r Bénédiction du Lendit. – Source : Gallica, Bibliothèque nationale de France, Département des manuscrits, Latin 962, domaine public. 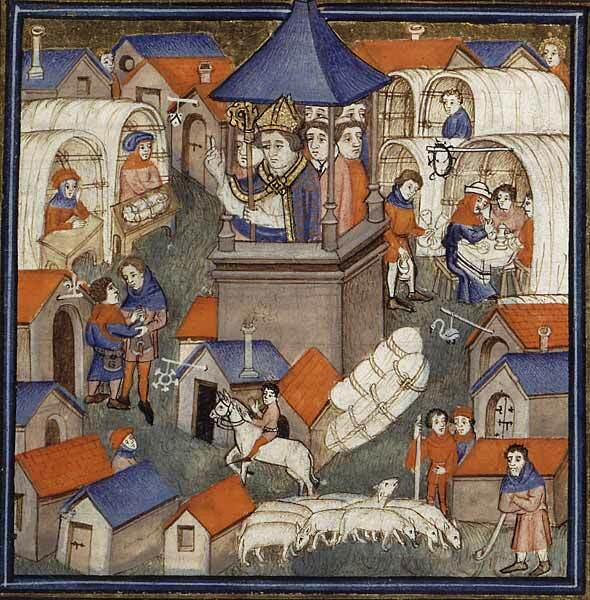 A "Foire du Lendit" means that this is around St Denis in France and we see a bishop of Paris blessing a trade show, a fair or market. 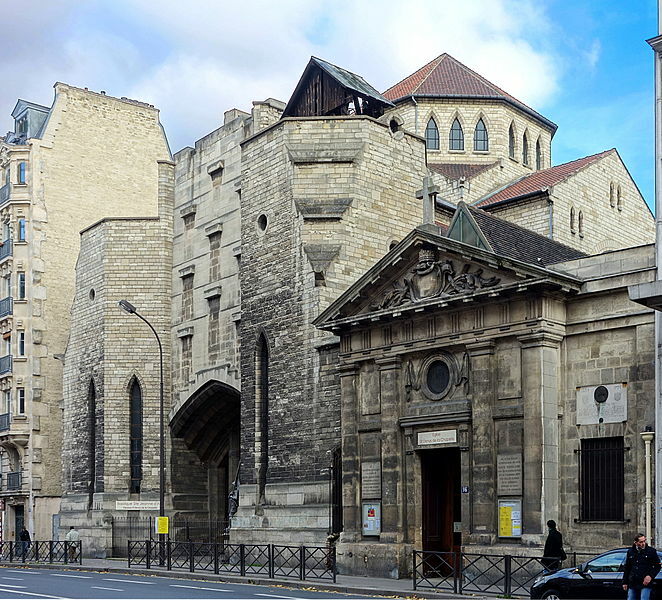 The fair of Lendit (or fair of the Landit), opened for two weeks every 11 of June, day of Saint Barnabé, until June 24, day of the Saint-Jean, with the plain Saint-Denis, between Paris and Saint-Denis. It was from the 9th to the 16th century one of the most important fairs in France and the largest in the Île-de-France. It attracted a thousand merchants from all over Europe and Byzantium… It sold the parchment used by the University of Paris and its students. In 1411, appears the last mention of the Perron in a "List of the price of lodges at the fair of Lendit" written under the abbey of Philippe de Villette. The Perron was a prominent stone on which one could stand or sit, located near the Montjoie, tumulus located on the way to the Estrée . 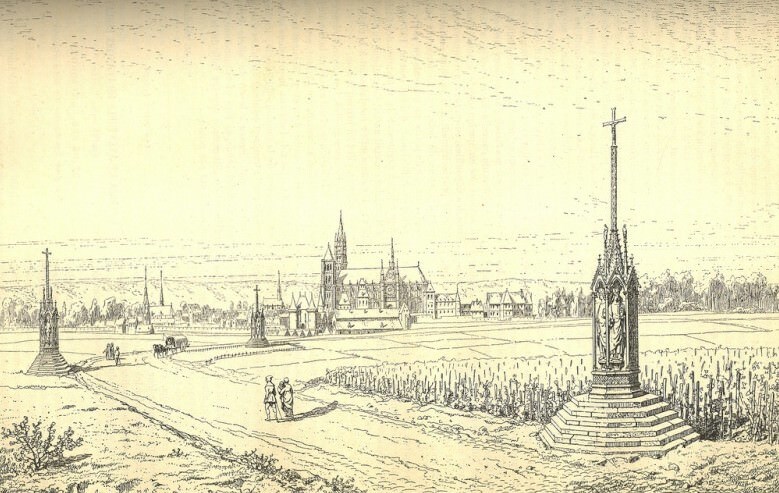 The Montjoie and his Perron served as a platform and a pulpit to be preached during the fairs: every year, the bishop of Paris came to bless the fair of Lendit in June. 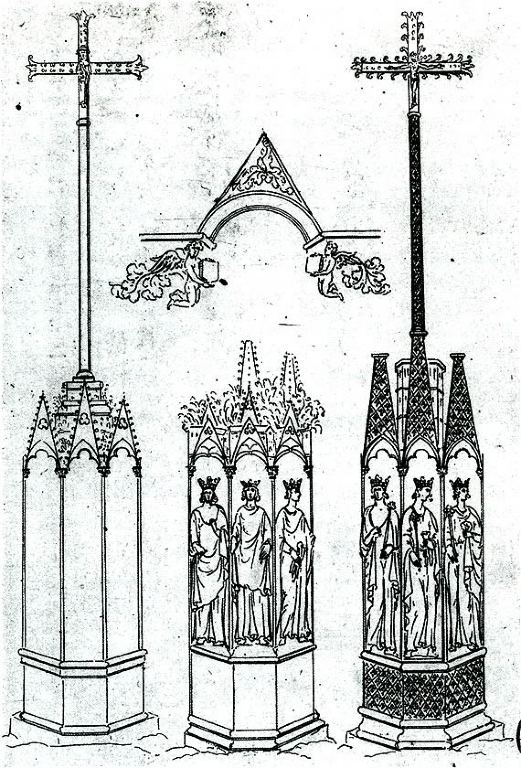 These are the Montjoie and the Perron which must be recognized under the veiled terms used by the Pontifical of the Church of Paris concerning the ceremonial of the blessing of the fairs: the most eminent place where the bishop settled with the procession, which required a rather large platform, was the Montjoie, while the highest place, a kind of platform for the sermon, was the Perron. A place told to the cadastre, a street, an impasse testify to the intensity of the memory of the Perron. While the depiction of the "building" may include a certain artistic licence, the disinterest of the people going about their business at that late medieval time is perhaps not. Not the answer you're looking for? 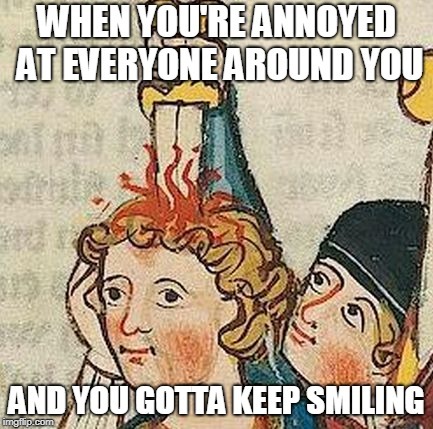 Browse other questions tagged middle-ages identification art or ask your own question. What is Lorenzo de' Medici holding in this painting? From what time can this jewelry date? What uniform does PewDiePie wear in this picture? Was there an alcohol abuse problem among monks and priests in the High Middle Ages in England? What uniform is in this picture? What are the dimensions of the house in this picture?